Trivia Did you know Patrick Scott Patterson Lied about these claims???? 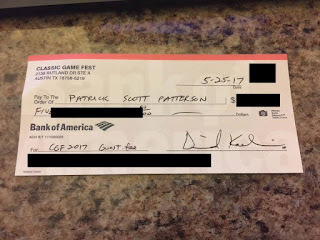 *** ALERT ALERT ALERT *** PATRICK SCOTT PATTERSON POSTS PHOTOS OF A BANK CHECK ON SOCIAL MEDIA. THIS BANK CHECK IS A REFUND OF HIS PANEL FEES. HE HAD TO PUT A DEPOSIT DOWN JUST LIKE ALL THE OTHER VENDORS. HE WAS PLANNING ON SELLING MASSIVE QUANTITIES OF RESCUED VIDEO GAME UNITS. THIS REQUIRES A LARGE TABLE AREA. DO NOT BE TRICKED OR FOOLED INTO BELIEVING HE WAS PAID OFF OR BRIBED FOR HIS SILENCE.